Human-Centered Design for Social Innovation is a five-week course that will introduce you to the concepts of human-centered design and help you use the design process to create innovative, effective, and sustainable solutions for social change. No prior design experience necessary. Acumen believes in the importance of incorporating the principles of human-centered design when creating solutions to problems of poverty so that low-income customers are provided with choice, not just charity. Businesses, social entrepreneurs and other innovators have used human-centered design for decades to create solutions for many different types of challenges. At its core, the human-centered design process is based upon the fundamental belief that gaining a deep understanding of the needs, hopes, and aspirations of potential customers and the lives they live yields incredible inspiration for new solutions. From this in-depth exploration into people’s experiences and environments, human-centered designers identify patterns and opportunities for concept development. And then it’s time to get tangible quickly, turning concepts into live prototypes and in-field experiments. Human-centered designers learn by doing and evolve their solutions based on real-time feedback. This five-week course will equip you with the process and methods of human-centered design so that you can be more intentional about facing and solving your current challenges. 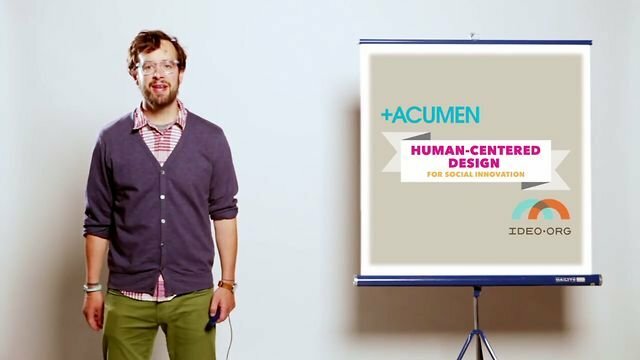 This course is an invitation to experiment with the power of human-centered design. Let it inspire you to approach challenges differently and experience how human-centered design can add new perspectives to your work. There are no in-person teachers or facilitators for this course. You will work through the course with a group of 2-6 people you will be refered to as your “design team”. You must find your team before you sign up for the course. You will select a different member of your design team to prepare and facilitate the workshop each week. This “Weekly Leader” will be responsible for organizing the necessary space and materials needed before the workshop begins as well as facilitating and keeping time during the workshop. There will be a homework assignment following workshops 2 and 4 where your team will be required to find and interview members of your local community (Week 2) and test your prototypes with users (Week 4). During the last week of the course, you will brainstorm with your team additional social sector challenges where you might apply human-centered design and commit to making the first step toward tackling a new challenge. The participation in the course is free of charge. You must register with a minimum of 2 people. E-mail jmartin@acumen.org if you’d like to learn more about starting a meetup for this course in your city.